There is a combination of honey, garlic, and spicy mustard that flavors these fresh salmon fillets. The salmon is an easy preparation and provides a healthy meal. The salmon takes just minutes to fix and bake. Heat oven to 400 F. Line a shallow baking dish with foil and grease lightly with olive oil. Combine honey, mustard, minced garlic, basil, and salt and pepper in a food storage bag or a glass or plastic container. Add the salmon fillets and seal or cover; refrigerate for 30 minutes to 2 hours. 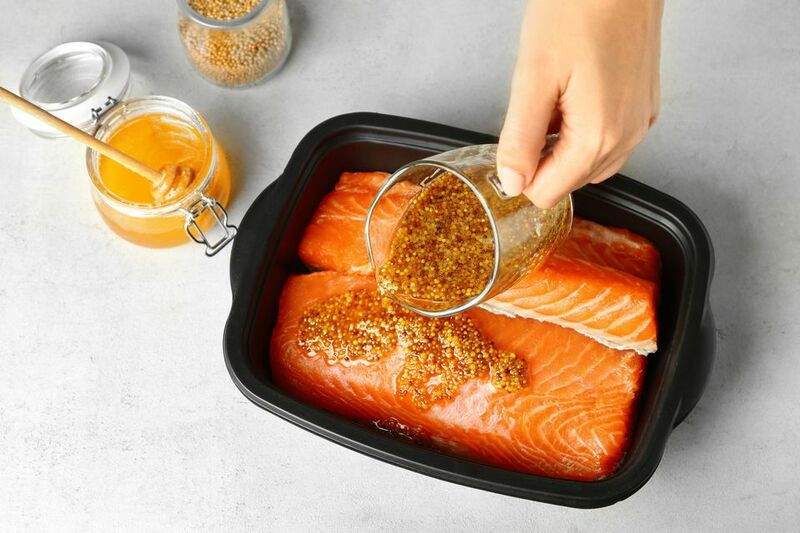 Remove salmon from the marinade and brush lightly with olive oil. Bake the salmon fillets in the prepared pan, skin-side down, for 14 to 15 minutes, or until fish is cooked through.